Description: THIS IS A 1942 MAUSER BANNER NAZI POLICE RIG, 9MM. THE LUGER IS IN VERY GOOD CONDITION. ALL ORIGINAL, NUMBER MATCHING INSIDE AND OUT ( BOTH MAGAZINES ARE NUMBERED TO THE GUN, VERY GOOD BORE AND GRIPS, MECHANICALLY CORRECT AND TIGHT. 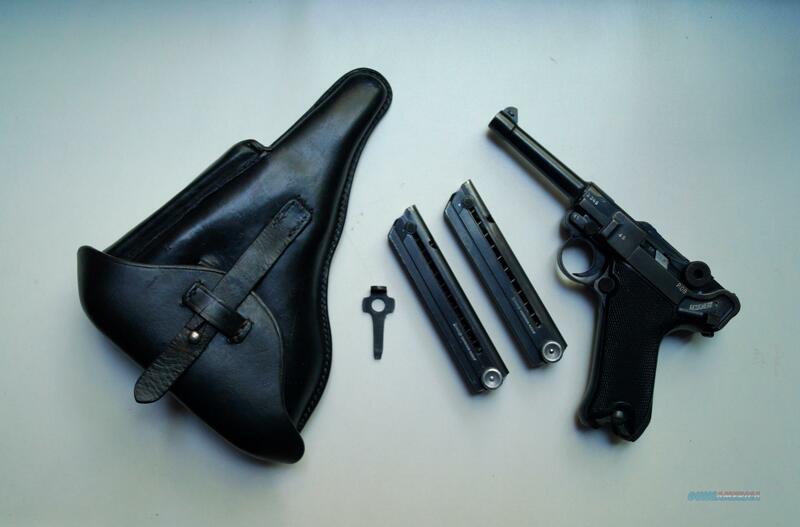 THE RIG CONSISTS OF THE LUGER, 2 ORIGINAL NAZI HANEL SCHMEISSER MAGAZINES, 1 ORIGINAL OTTO SINDEL POLICE HOLSTER AND 1 ORIGINAL NAZI POLICE MARKED LOADING TOOL. THEY DON'T COME BETTER THAN THIS.